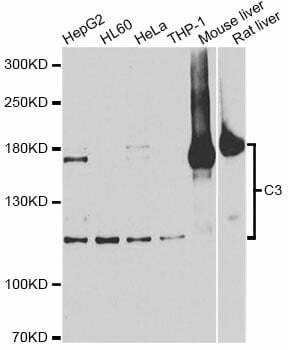 Western blot analysis of extracts of various cell lines, using C3 antibody. 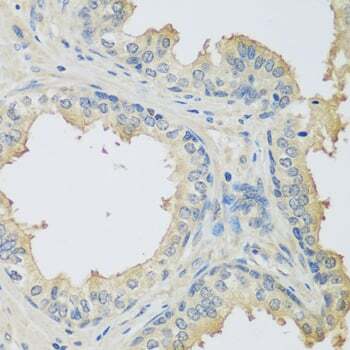 Immunohistochemistry of paraffin-embedded human prostate using C3 antibody. C3 plays a central role in the activation of the complement system. Its processing by C3 convertase is the central reaction in both classical and alternative complement pathways. After activation C3b can bind covalently, via its reactive thioester, to cell surface carbohydrates or immune aggregates.Derived from proteolytic degradation of complement C3, C3a anaphylatoxin is a mediator of local inflammatory process. In chronic inflammation, acts as a chemoattractant for neutrophils (). It induces the contraction of smooth muscle, increases vascular permeability and causes histamine release from mast cells and basophilic leukocytes.